I think I may have a problem with off the shoulder tops. I just can't seem to get enough. I have so many different styles and colors. This one from Vici is one of my current faves. I love all the details like the tie at the waistline!! So cute right? 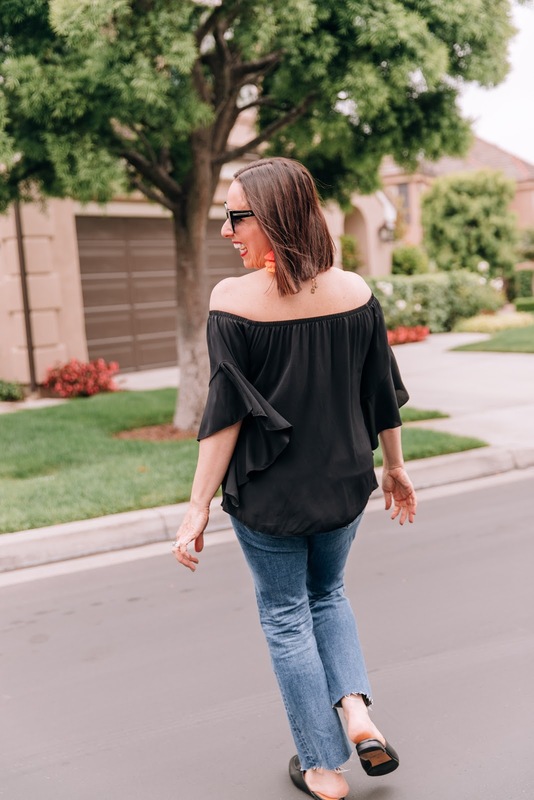 I paired this cute top with these raw hem AG Jeans. These are becoming my new favorite pair of jeans. I visited the AG store in Fashion Island and tried on many different styles. I found for my body type, more of a mid rise jean like this style , the Joni, is more flattering for my body type. You have to check these out. I'm truly in love. I added these cute Gucci mules (can you say OBSESSED) and these amazing G2G earrings and this look was complete!!! Thanks to Kara Nixon for photos. You can shop this look by clicking on the links above. Happy Reading!!! !